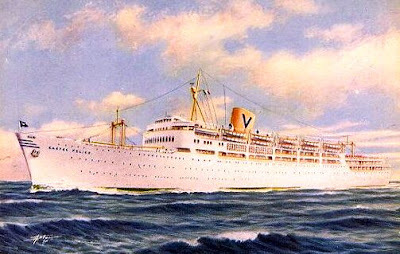 TN Castel Felice, the immigrant ship which brought my parents to Canada. Photo credit: Reuben Goossens. I'm the child of immigrants. Their taking a chance on Canada worked out well for them, and it worked out very well for me. Within a couple of days of getting off the boat which had whisked them from Scotland - I'm not that old, but they did manage to come over on one of the last immigrant ships (better luggage allowance than on a plane, they told me) - they had nice place to stay, a car, and most importantly decent jobs. But the facts that they were white, native English speakers, and British subjects of the "right" kind certainly made things easier for them. Without their coming to Canada, I would probably have never gone to university - no one else in my family ever did, nor has anyone's children or children's children who stayed behind, with one notable exception. Instead, I wound up with three university degrees. But children of immigrants often do quite well in Canada. It's the initial struggle of the first generation that increasingly concerns me. I had lunch the other day with a friend of a friend of a friend. He spoke perfect English, Mandarin and Hindi. Yes, Mandarin AND Hindi. Used to publish a Chinese newspaper for Hindi speakers in India back when he lived in China. Happened to have a Ph.D. in communications from a good American university. Oh, and did I mention the M.P.A. from a Canadian university, obtained after the Ph.D. because he thought it prudent to have a Canadian post-secondary qualification as well. He'd just become a Canadian citizen, and was proud of that achievement. Proud of the country he chose, rather than was born into. Proud that he had beat out a whole lot of other applicants in being granted the right to live out the rest of his days in Canada. Problem was, he couldn't find a job in his field. Now this wasn't a little, "I've been unemployed for a few weeks" kind of problem. Or an "oh, I have to run the company, everything else is beneath me" kind of situation. This was a he'd been looking for years, and years, and years type of situation. He become so desperate, he was thinking of returning to his country of birth. After so many years away. He didn't want to wind up like a friend of his - another Ph.D. graduate - who had recently committed suicide because although accepted as an immigrant to Canada, he couldn't find a job. And I assure you, this is a true story - I wish it weren't. The only advice I could offer him was to go into business for himself. It perhaps wasn't great advice, but turned out to be the same advice his girlfriend - another Ph.D graduate and immigrant, but one who wasn't a visible minority, and most importantly one with a job - had given him. He wasn't thrilled by the prospect of becoming an entrepreneur - it wasn't why he had worked so hard at his studies. Lots of finger pointing has gone on over Canadian immigrant policy from the days the first immigrants showed up in Canada, mainly involving claims that Canada: (a) accepts too many of a certain type of people, (b) doesn't accept enough of certain types of people (sometimes the same people who it is claimed we accept too many of), or (c) shouldn't accept anyone at all as immigrants. Fortunately, very few seem to support the third view - most just argue over who we should be accepting or not accepting. For me, immigration has never been primarily about addressing our low birth rate (most immigrants these days are arriving at an older age and having smaller families themselves), or our job market deficits (although this is an important function). It's about keeping Canada invigorated and full of fresh ideas and fresh faces. The alternative to immigration can be stagnation. But I don't believe it's solely the responsibility of government to make arrangements for these immigrants to "fit in." Sure government has a role, but it's also each and every one of our personal civic duties. Currently I'm volunteering with T.R. Leger Immigrant Services in Cornwall, Ontario, which helps new Canadians learn the official languages and also provides "settlement services" like assistance in applying to become a citizen. They service an immense area comprising everything in Ontario east of Kingston that's outside the Ottawa urban area. Since I'm an immigration and refugee lawyer practicing throughout Eastern Ontario - and immigration and refugee lawyers outside the big cities are rare creatures - I try to help all those with problems at one of the three Eastern Ontario land border crossings (Lansdowne, Prescott & Cornwall), the Ottawa International Airport, or those who are already in Canada but need to renew their status or apply for a different kind of immigration status, like visitor visas, study permits and employment permits. Sometimes I work on refugee claims and applications for permanent residency under skilled worker, experience class, family class or business class programs (including investor, entrepreneur and self-employed categories). Immigrants need to do a whole lot of adapting to our society. The fact they have often left everything dear to them behind to take a chance on Canada demonstrates in the strongest possible terms their commitment to becoming "Canadian." But adaptation is a two way street. As they change for us, we need to change for them. Integration or assimilation are all just words describing a process of immigrants changing society as society changes immigrants - it's never a one-way process, as much as some might wish it was. No matter what corner of urban or rural Canada (or any other country) you inhabit, I urge you to ask yourself: "what can I do to make an immigrant feel like s/he belongs?" Because even if you haven't been thinking about it - and I certainly didn't used to myself - your future depends on that immigrant deciding that s/he made a good choice. That Canada chose them as much as they chose Canada. That would be so frustrating (understatement) to be so qualified yet not be able to find a job. Interesting post. What a splendid job you're doing, Gordon, in helping immigrants to settle in our country. As you say, we're all immigrants. My grandfather, Thomas Smith, was a fisherman from Gaspé. His grandfather was a fisherman from Scotland whose boat, in a storm, got stranded in a small village (Petite Rivière, Qué.) He met a pretty girl, and just settled happily, among French Canadians. My grandfather (who never spoke English) used to say: "Les poissons le comprenaient. Ils sautaient dans son bateau!" When I was nursing, I was flabbergasted to discover highly qualified immigrant doctors doing laboratory work while trying to be admitted in overcrowded internship programs. And when they succeeded, it took at least 4-5 years for them to be finally a MD. It's a shame. We are so short of family doctors in Canada. My own doctor (retired now) was Indian, born in Kenya, studied in Uganda and specialized in cardiology. He still had to go through the same process when he emigrated. He didn't redo cardiology. He just opened a Doctor's Office. He said he could help the new Canadians better as a GP. With such a tremendous experience and an uncanny diagnostic eye, I credit him for saving my life a few times. I'm proud to be still associated with a group he formed to help immigrants to settle in our country. As you say, it's very difficult for new people to feel that they belong unless we welcome them with an open heart and ease the adaptation process. I just read that Toronto has the dubious distinction of having more immigrant doctors as taxi drivers than any city in the world. Plus ça change plus c'est la même chose! Thanks for such an interesting post. Some of my colleagues at work are involved in foreign qualification recognition and I hear about the efforts by governments to ensure immigrants are able to work in their fields when they come to Canada (I don't work in this area - I am more involved in domestic labour issues). It all seems so difficult and I don't know what the solutions are. It is complicated by the fact that there are different categories of immigrants. I am most worried about the refugees and their plight because I have met some of them and they have endured horrible things. I think you are right - the first step is to ensure that Canadians understand who immigrants are and why we should all embrace them. Thanks very much for all your most thoughtful comments.